Whether for it is for education or entertainment we are all watching more videos than ever before. YouTube states that more than one billion hours of videos are watched daily. We have more tools to record and share videos than ever before. With the tap of an app or click of a link, you and your students can be making videos to tell stories, teach lessons, or to simply entertain. 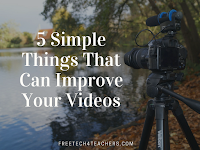 But before your students make their next videos, have them review these five simple things they can do to make their videos better. 1. Make it short and sweet! Two minutes or less. It's better to have two videos that are each two minutes long than it is to have one video that is four minutes long. Don't believe me? Check out the research that Wistia published last summer. Based on data from more than 500,000 videos played more than one billion times, Wistia determined that there is a significant drop-off in viewer engagement after the two minute mark. Recording on a mobile phone? Turn your phone sideways to capture in a landscape view. We view the world in "landscape mode" so record it that way too. Or think of it this way, you watch your television in landscape mode so capture and publish your video that way too. If you don't have the time or knowledge for using green screen techniques, pay attention to your background. 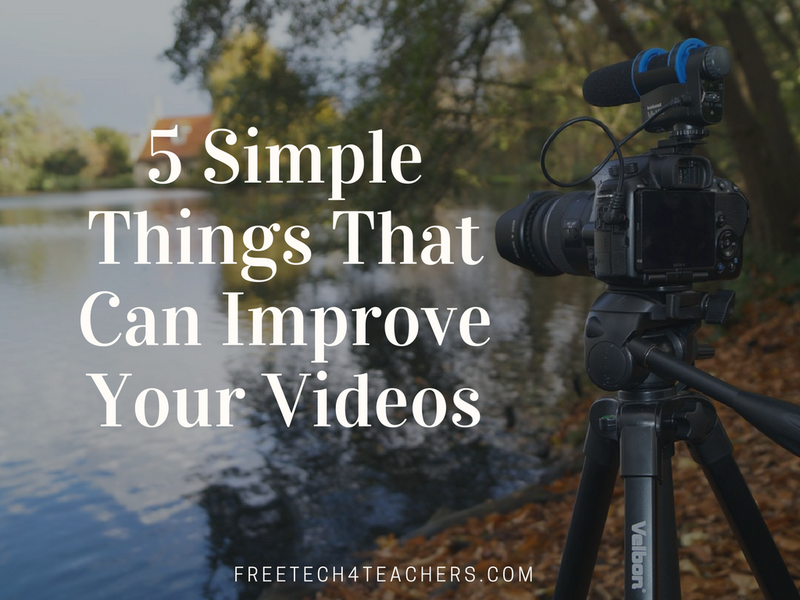 Are you making a simple video announcement to post on your school's blog? If so, avoid using a plain white wall as your background so that it doesn't look like a hostage video. A bookcase can make a great background. Playground equipment can make a nice background too. Are you recording outside or near a window? If so, make sure you're not washing out your subject with too much background light. 4. Show us your eyes not your nostrils! When recording with a webcam that is built into your laptop, elevate the webcam to at least eye level. Otherwise everyone is looking up your nose! I have three big books that I put under laptop when I host webinars and Facebook live sessions. On a related note, look at the camera instead of at your laptop's screen. Your phone's or your computer's built-in microphone might be fine for quick "selfie videos," but for other projects you should consider getting a nice external microphone. For under $50 you can get a nice, durable Snowball microphone to plug into your computer. It will filter wind and other background noise. There are plenty of external microphone options for cell phones too. I use one made by Insignia. For ease of use, I prefer an external microphone that plugs into your phone or computer directly rather than through a Bluetooth connection.